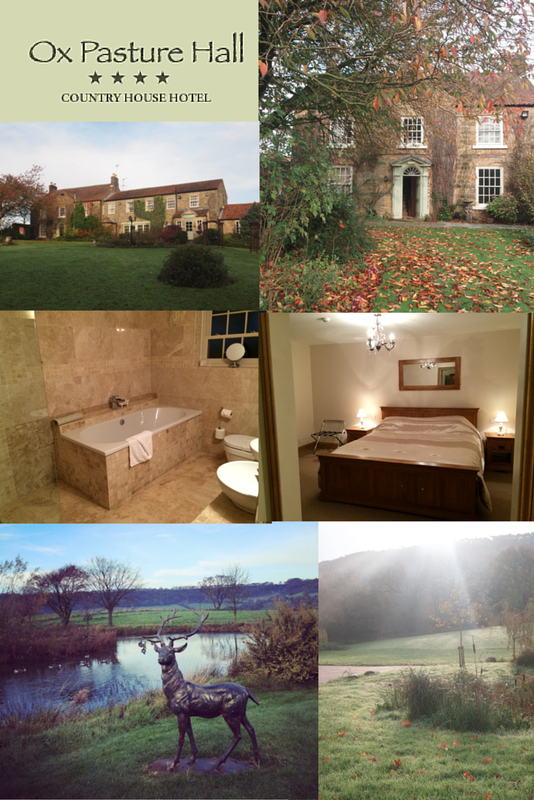 This weekend, hubby and I travelled to the lovely Scarborough in North Yorkshire, to review Ox Pasture Hall Country House Hotel, located in the historic North Yorkshire Moors. 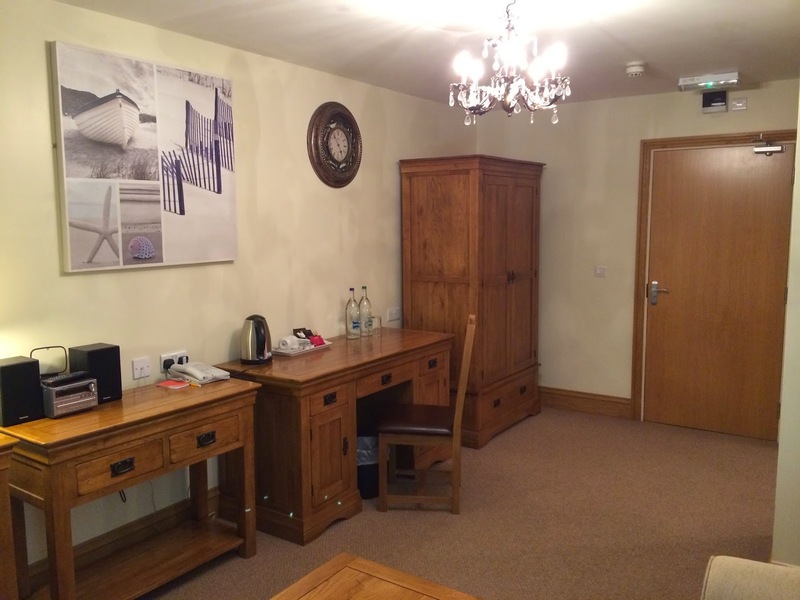 The hotel is privately owned and is situated just a few miles from Scarborough, and just a half hour drive to famous seaside towns Whitby and Robin Hood's Bay. It was exciting to be heading off for a romantic weekend just the two of us! Bert was safely tucked up at home with his Nanny and Auntie, and so we headed off feeling well in need of a good rest and relax, knowing Bert was in great hands and would be having a blast himself. Our drive from Bedford to Yorkshire took us around 3.5 hours, and as we neared the hotel and began winding our way through the beautiful Yorkshire countryside we began to get super-excited. What would the hotel be like? Would it meet our expectations after looking at their great website and reading other people's reviews of the hotel? Would it be the perfect country getaway we were after? As we approached the hotel's drive a couple of graceful deer leaped across the lane in front of us, a sure sign that we were truly in the heart of the countryside! The driveway leading down to the hotel (Lady Edith's Drive) is just stunning and on first appearances the hotel looked magnificent. 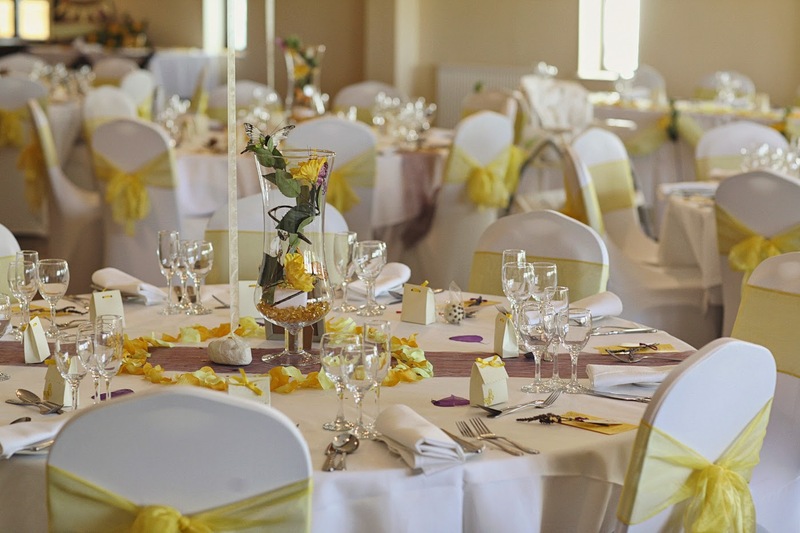 It is situated in 17 acres of the finest manicured gardens and grounds, and as we approached reception it was clear to see how beautifully maintained the outside spaces are. Hiding amongst the heather - Ox Pasture Hall Country House Hotel. With the warmest of welcomes from the lovely hotel receptionist we were shown to our suite - as we walked through the hotel and courtyards, we were shown where our dinner and breakfast would be served, where the lounges were, and told times for breakfast and check out. We had all the information we needed, and couldn't wait to see our suite. We were shown to suite 28 (my age!) called Filey, and wow, it really was magnificent! The suite door lead into huge lounge area, with a very large bedroom on the left, and a floor-to-ceiling marble-clad bathroom at the rear left of the suite. The whole suite was furnished in very classic looking immaculate wooden furniture, the carpet throughout was spotless, walls were perfectly painted with not a single mark on them, and the decor was classic and very elegant with chandeliers lighting the suite perfectly. The living area - with sofa, coffee table, desks, wardrobe, dressers, TV with DVD player, music system, and tea/coffee making facilities. There was also an information pack with everything you could need to know about the hotel, as well as a brilliant guide to North Yorkshire magazine, full of lots of ideas and inspiration for what to see/do while you visit. 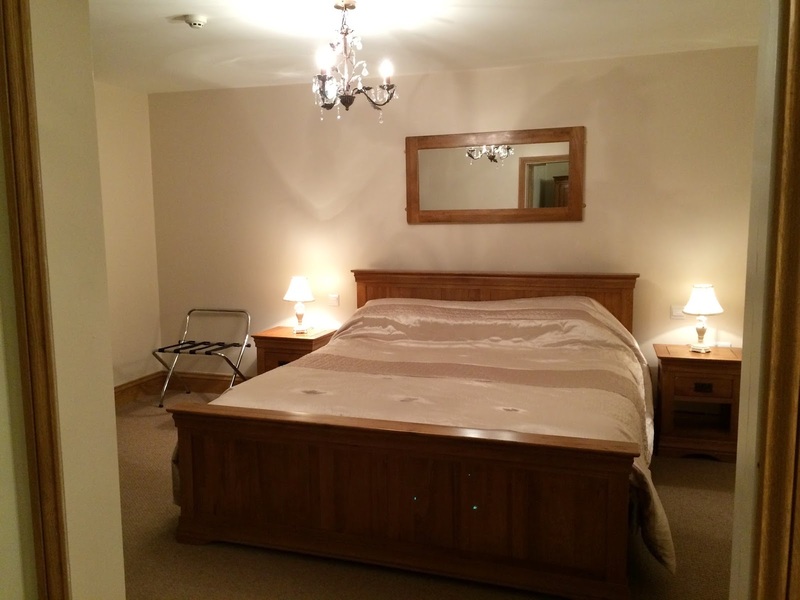 The giant and very comfortable bedroom - hubby said the bed was like sleeping in a giant marshmallow! Also with TV, chest of drawers, full length mirror, case stand, bedside tables and a full length mirror and hairdryer, perfect for getting ready for dinner. The lounge area from the sofa, and the suite entrance. In the wardrobes were two of the fluffiest robes, and plenty of hangers for popping your clothes away. We were supplied with two large bottles of natural mineral water (still and sparkling), plenty of tea and coffee, and some scrumptious biscuits. 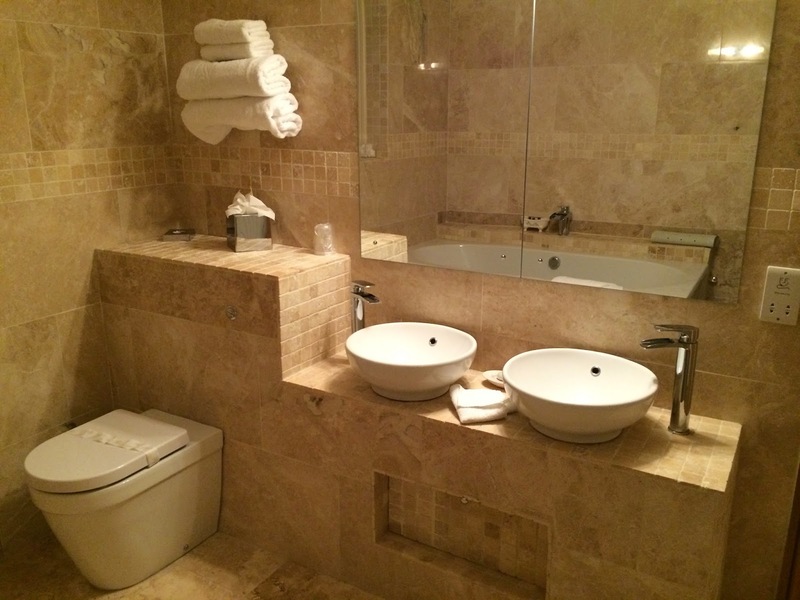 The stunning marble bathroom with double sink, WC, very large bath, and large rainfall shower. 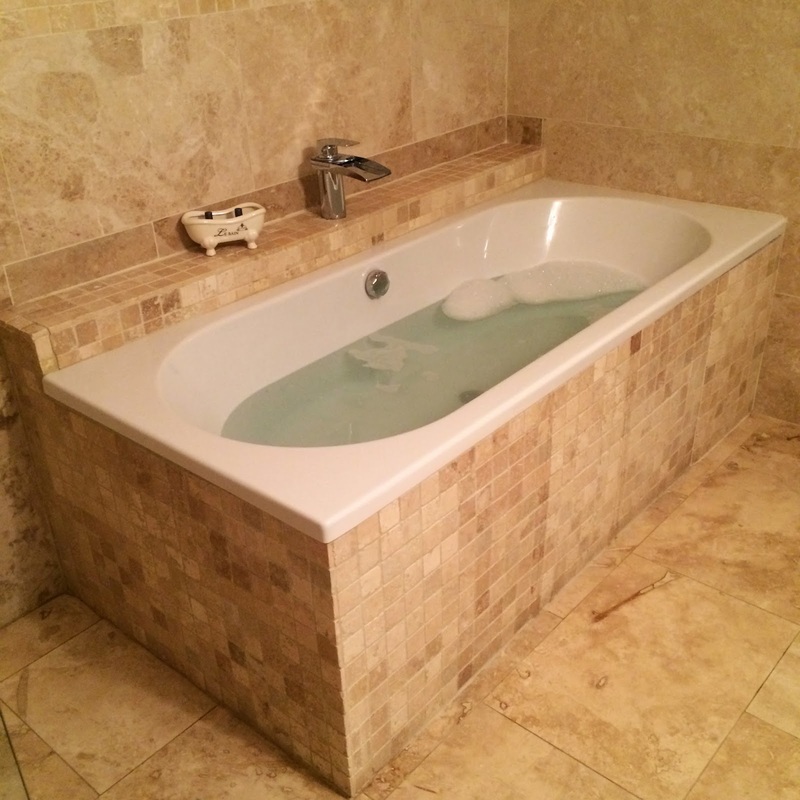 Who could fail to be totally and utterly relaxed when sinking into this giant bath after a long drive? The fixtures and fittings just screamed luxury. 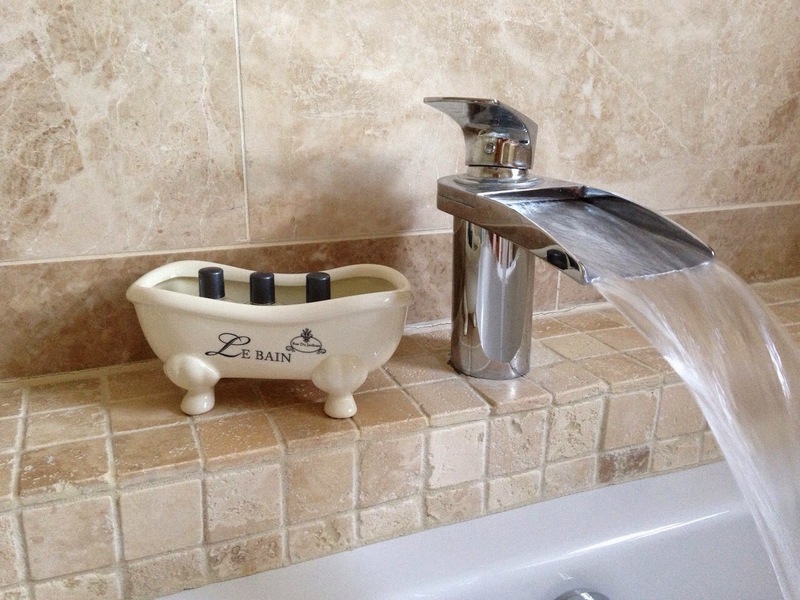 The toiletries provided smelled just yummy, and were presented beautifully in the mini bath tub! Pleased as punch with our beautiful suite, we unpacked, made a hot drink and relaxed for a couple of hours lounging in front of a film, and planned what we'd like to do on the following day. I relaxed in a beautiful deep bubble bath, before getting my glad rags on ready for dinner with Liam in the hotel's Courtyard Restaurant. The Courtyard restaurant is the only restaurant in Scarborough which has been awarded 2-rosettes for culinary excellence as well as being recommended in the Michelin guide. So, with high expectations, and hungry tummies we were excited to read the menu and see what culinary delights the hotel had to offer us. 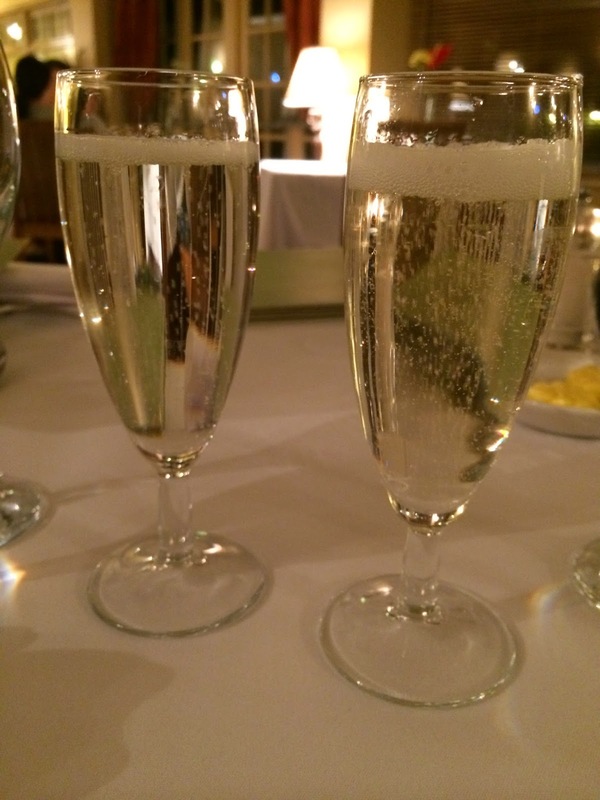 We were seated at our table on time, and greeted by the very lovely Maitre'd who soon bought us over two menus and a glass each of prosecco to enjoy while we feasted our eyes on the very exciting menu. We also had a beautiful amuse-bouche of carrot and orange soup, followed by slices of the most delicious fruit/nut and plain white homemade breads with salted butter, and a palette cleanser of a strawberry consumé after the starter. My amazing meal - the food was truly outstanding. Hubby's meal - the beef was the best either of us has ever tasted! 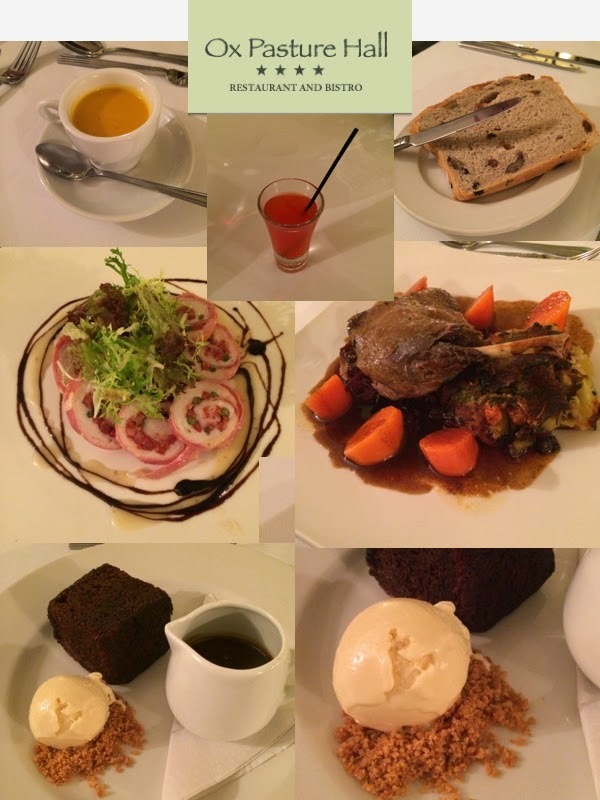 We were blown away by the quality of the food at Ox Pasture Hall - Liam's beef main course was truly the best beef either of us has ever tasted, and my sticky toffee pudding was by far the tastiest dessert I've ever had the pleasure of eating. I would recommend the restaurant on those two dishes alone. The amazing quality food twinned with impeccable service and very beautiful presentation of all of the dishes, means that this restaurant really does deliver something very special. Liam and I have eaten in the Michelin starred restaurants of both Heston Blumenthal and Gordon Ramsay, and I honestly enjoyed this food just as much (at times perhaps even more) than when dining there. Portion sizes were generous considering the standard of the food, and we left the restaurant utterly delighted at what we'd just experienced. The meal would have cost around £100 for the both of us - this included two glasses of prosecco, two glasses or merlot, and two coffees to finish. I think this is an absolutely incredible price for such outstanding food in such a relaxing and beautiful atmosphere. 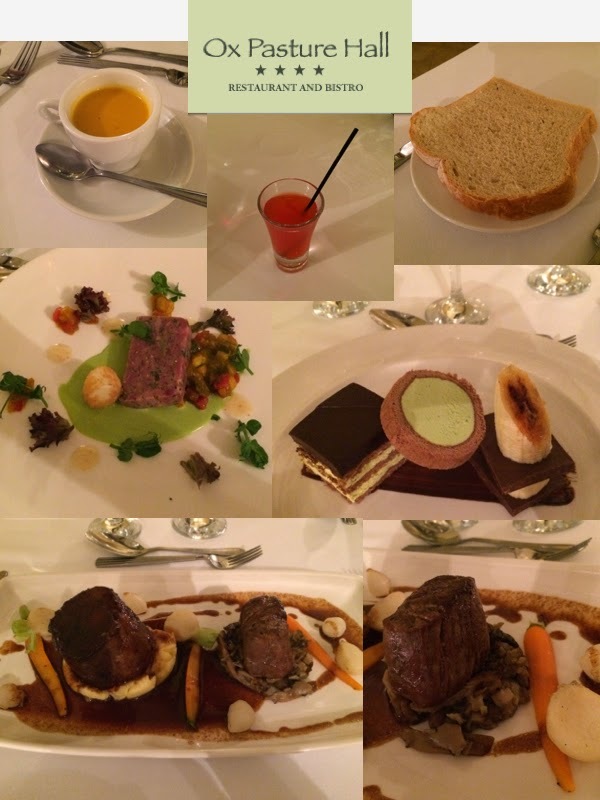 At around £50 per head, with drinks, I really couldn't fault the value for money at Ox Pasture's Courtyard Restaurant. Following dinner we headed to the public lounges to enjoy another glass of wine, and then headed back to our suite to enjoy a film, a few drinks and a full night of undisturbed sleep (heaven). The public lounges were so beautiful: with an atmosphere not dissimilar to a hunting lodge - the tartan fabrics and carpet, warm log fire, and stone walls oozed warmth and comfort. We both slept soundly and found the hotel to be very peaceful. There was limited phone signal and we were unable to connect to the wifi in our suite - however, received full phone signal and a strong wifi connection in the main hotel and the public lounge areas, so it was easy to pop over if I needed to call home to ensure all was okay. In fact, it was rather rare and marvellous to not have connectivity in our suite, as it meant I stepped away from social media for the weekend, and just found myself 100% in the moment, enjoying the experience without feeling the need to tweet or instagram about it. If I were staying for longer, I might have found it a little irritating, but for a weekend away it turned out to be a blessing in disguise. On Sunday morning feeling very relaxed and well rested we headed back to the hotel restaurant for a 9am breakfast (breakfast is served from 7:30am - 10am). After such success at dinner, we had high expectations for our breakfast, and luckily Ox Pasture did not let us down. 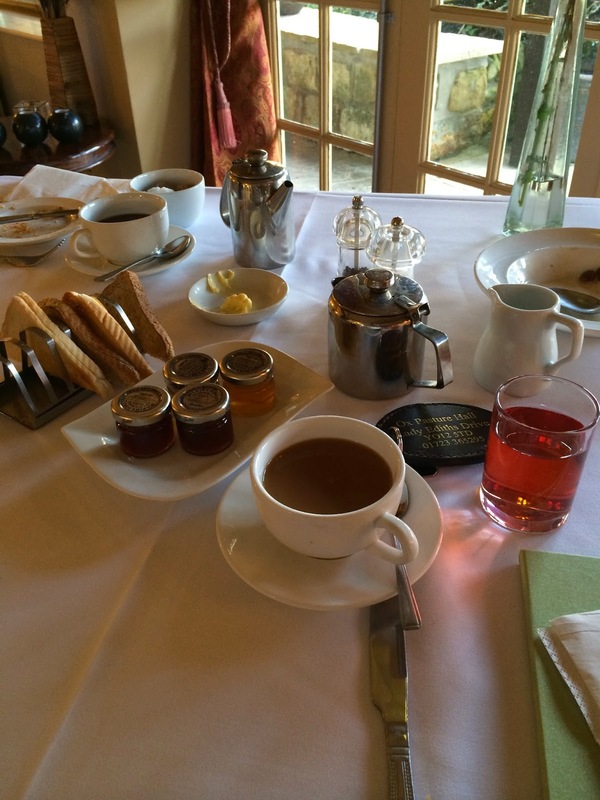 We were seated and instantly bought our choice of tea and coffee - there was a buffet full of cereal, milk, fresh fruit salad, yoghurts, croissants and fruit juices which we could help ourselves to while we chose from the menu for the cooked breakfast option. With plenty of choice for whatever you fancied, hubby and I both opted for the Full Yorkshire Breakfast (why on earth would you stay in a hotel and NOT have a full on fry up?!) You were able to choose which type of egg you wanted on your breakfast so I opted for scrambled eggs, while hubby chose poached. 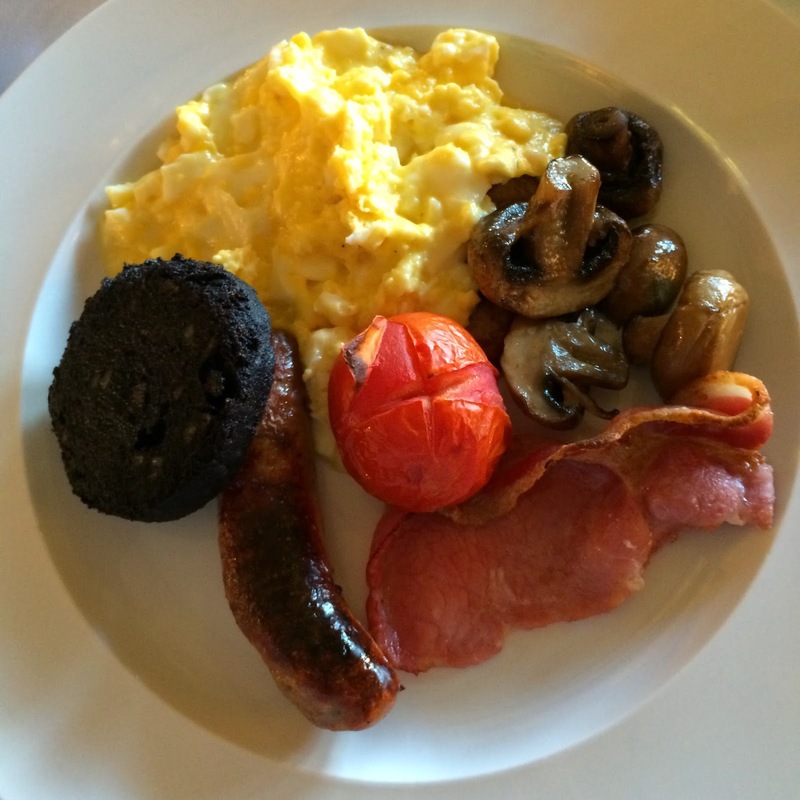 My scrumptious breakfast: Bacon, sausage, black pudding, scrambled eggs, grilled tomato and sautéed mushrooms. 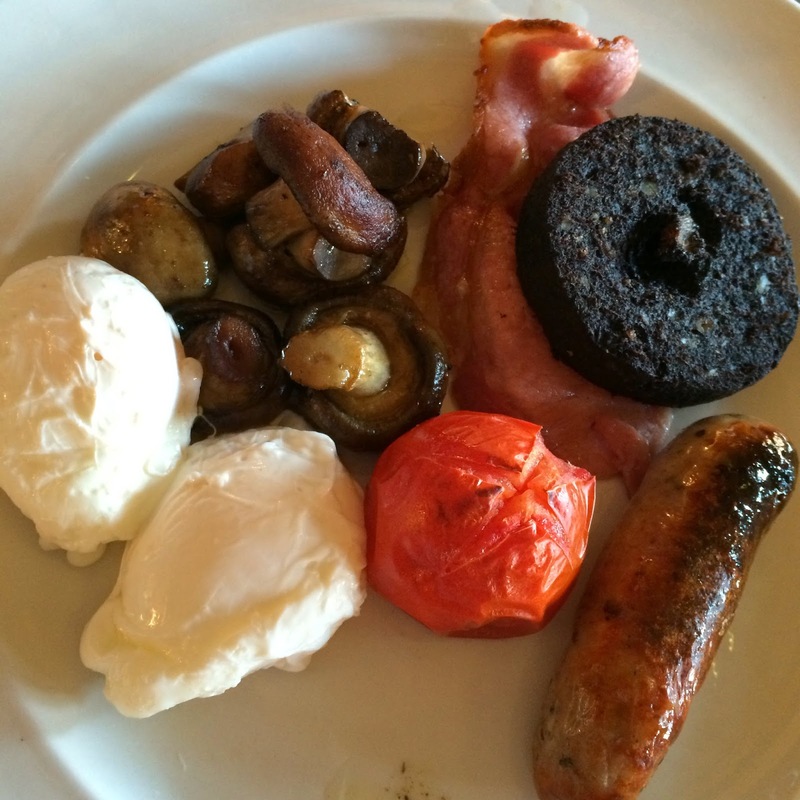 Hubby's breakfast: Bacon, sausage, two perfectly poached eggs, black pudding, grilled tomato and sautéed mushrooms. I'm not usually a lover of black pudding, but I'm always willing to give everything I'm served to eat a try before I decide if I like it or not, and on this occasion I'm so glad I did give it a go as it was completely delicious - tasting like a mixture between a herby stuffing and a spicy sausage, I gobbled up every last crumb of it, and would gladly eat it again and again. My scrambled eggs were perfectly creamy with the right amount of runny-ness. The bacon was perfectly smoked, and slightly crispy - just how I like it. The sausage was incredibly meaty with a delicate cumberland spicing, and the mushrooms were huge and packed a punch of savouriness that every fried breakfast needs. Hubby's eggs were poached to perfection with still runny yolks and just set whites, and we both devoured the plates greedily. You could tell that the ingredients used in the breakfast were not only fantastic quality but had clearly been cooked to order, as the whole thing tasted incredibly fresh, which is a rarity in my experience of eating cooked breakfasts in hotels - usually you're faced with a stale buffet full of food that's been sat around sweating all morning, not at Ox Pasture Hall. After breakfast we set off to explore the hotels grounds in the daylight, and I was truly blown away by Ox Pasture's stunning location and perfect gardens. The courtyard outside our suite, complete with gorgeous water fountain. 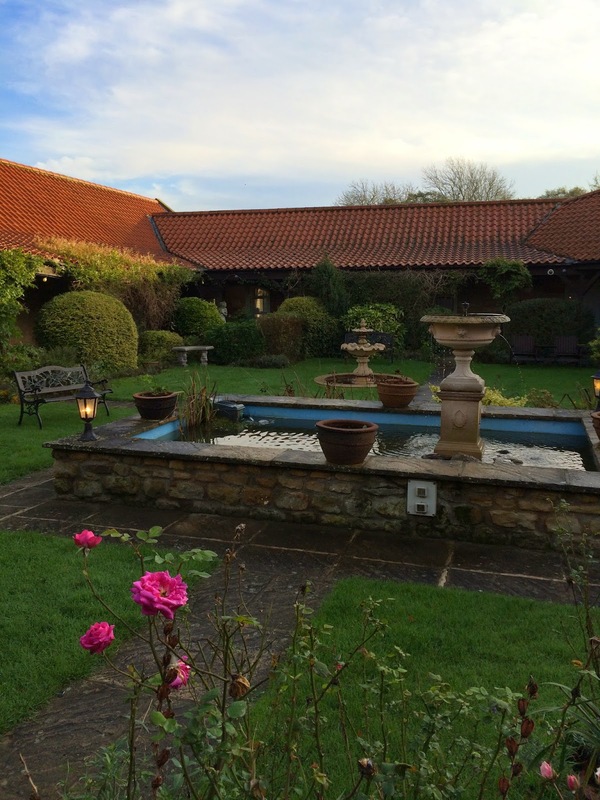 The central courtyard garden which the Courtyard restaurant and bistro both look out onto. During our time exploring the grounds of the hotel we saw at least two, perhaps three gardeners/groundsmen hard at work maintaining the high standard within the gardens and grounds. It's blindingly obvious to any guest staying at Ox Pasture Hall the amount of work that goes in behind the scenes to maintain such a beautiful hotel and gardens. After our 11am check out, we jumped in the car to explore the local sights and take in some sea air. We wanted to go for a nice walk to burn off some of the (many!) delicious calories we had consumed, so we headed to Boggle Hole where we walked across the coastline to the picturesque smuggler's town of Robin Hood's Bay. I had visited Robin Hood's Bay as a teenager, and I fell in love with it back then - I couldn't wait to take Liam, and show him the beauty North Yorkshire has to offer. We had the most stunning weather you could ask for: who'd have known it was early November? Little old me: exploring the beach in my wellies - still a child at heart! We walked for a good hour and a half, explored the gorgeous little seaside town, had a steaming coffee in a quaint pub overlooking the beach, and bought a few souvenirs to take home for Bert. I loved the beautiful buildings, winding streets, cobble stones and bunting which adorned the gorgeous Robin Hood's Bay. Hubby found himself at The Robin Hood's Bay Men's Institute: we thought this very funny considering my membership to The Women's Institute - we didn't know a mens version existed! Apparently this building steeped in history now houses Robin Hood's Bay Men's snooker team! You know you're in the country when you come across charming shops like this to buy your food shopping - even better when you get to read gorgeous little notes like this on the window! 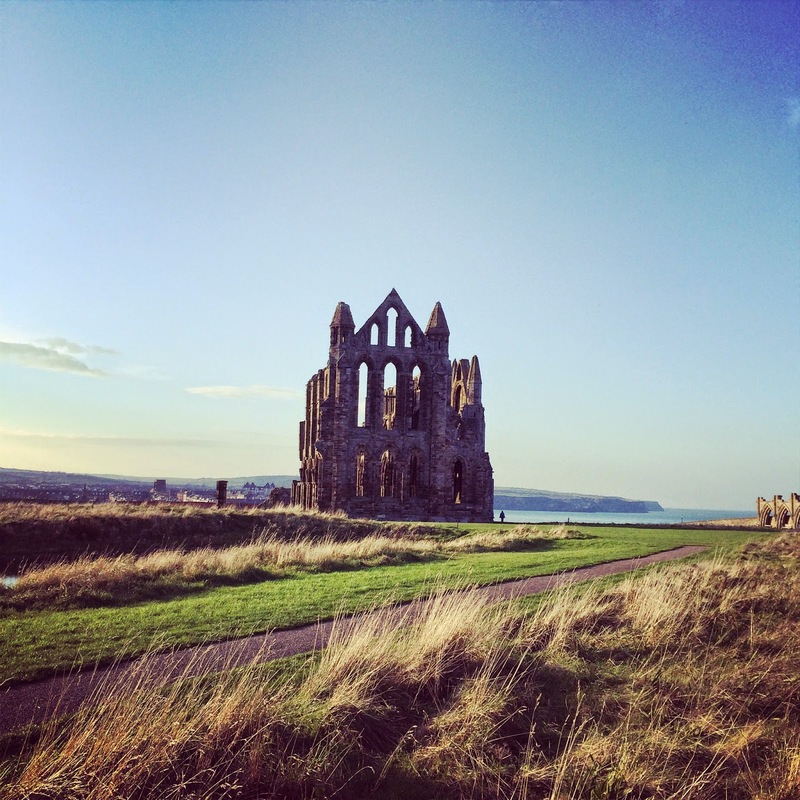 After a blissful few hours at Robin Hood's Bay we headed back to the car, and drove just a few miles down the road to Whitby, where we visited the famous Whitby Abbey. If you've never visited this landmark then you must make an effort to go, you'll not be disappointed - it is an absolutely awe-inspiring ruin, which oozes history and has such an amazing presence in the landscape. The stunning Whitby Abbey which was built in the year 657!! 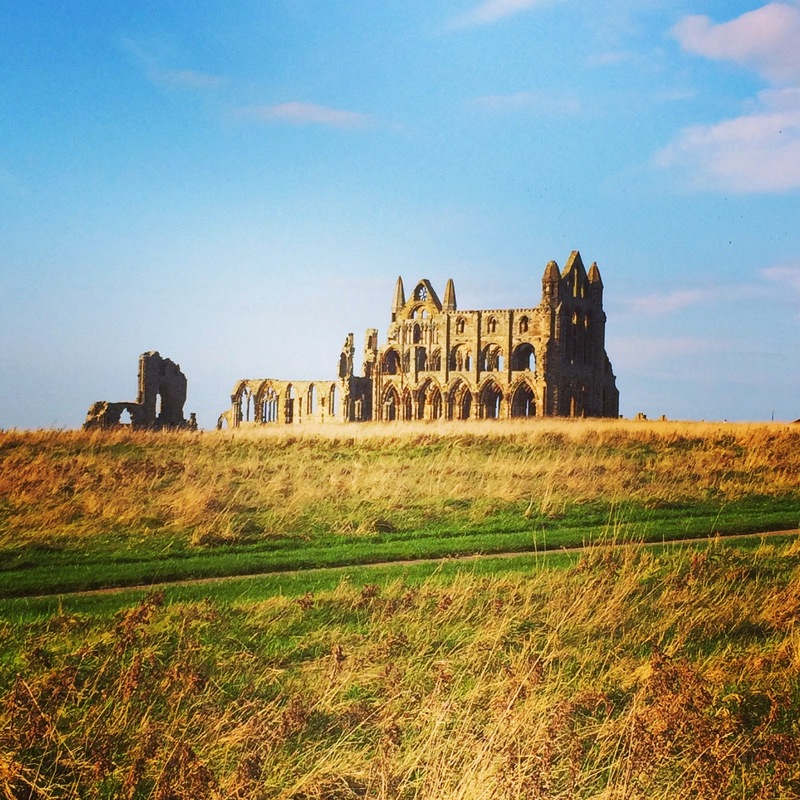 Whitby Abbey House, with the Abbey just visibly peeking out from the side - such an amazing landmark to visit. A perfect day for sight seeing! The Abbey from the side - you can walk all round the abbey walls for free, or pay £6.60 to go in and truly explore the ruins. Up on the hill at Whitby Abbey there are the most breath-taking views across Whitby. From Ox Pasture Hall hotel as well as exploring Robin Hood's Bay and Whitby you could easily drive in the other direction towards beautiful Filey, or drive just two miles into the centre of Scarborough. 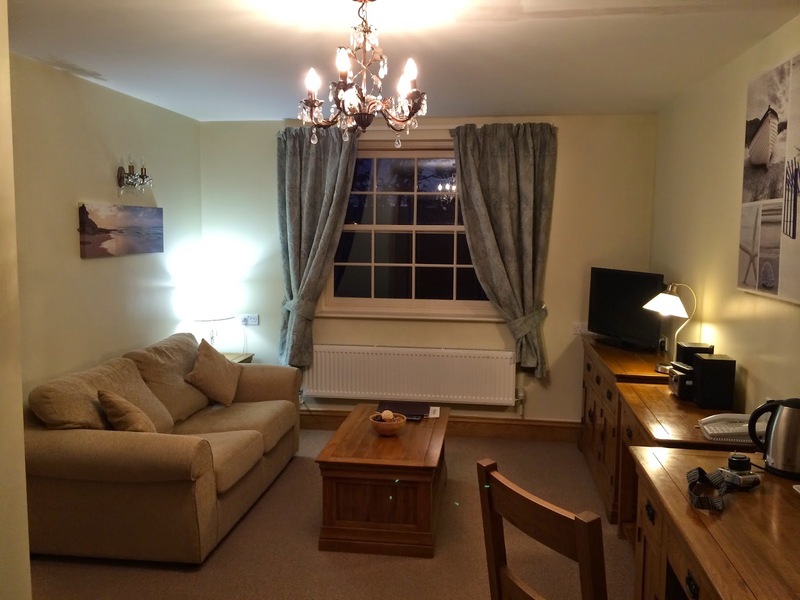 The hotel is so perfectly located you would never struggle for things to see, places to visit and activities to enjoy - so much so that hubby and I are desperate to visit again, just so as we can see more of this stunning area of Yorkshire coastline and country park. We rounded off our magnificent weekend away by heading back to Ox Pasture Hall for afternoon tea, before heading home. We sat in front of the log fire in the lounge and was served our afternoon tea by the friendly young waiter we'd met the previous night. a selection of petit fours cakes: lemon cheesecake, chocolate macadamia nut brownie, profiterole and chocolate/pistachio layer mousse cake. Giant and still warm fruit scones, just delicious! Scones, cream and jam … is there a better combo?? Beautiful petit fours cakes - a real afternoon delight. The afternoon tea really was the perfect end to an even more perfect weekend. We felt so lucky to have been invited to review such a gorgeous jewel in the North Yorkshire crown, and would absolutely recommend it to anyone looking to stay in North Yorkshire, or simply looking for somewhere utterly beautiful to escape to for a while. While we were staying at Ox Pasture Hall I couldn't help but notice the incredible facilities they have for hosting weddings. 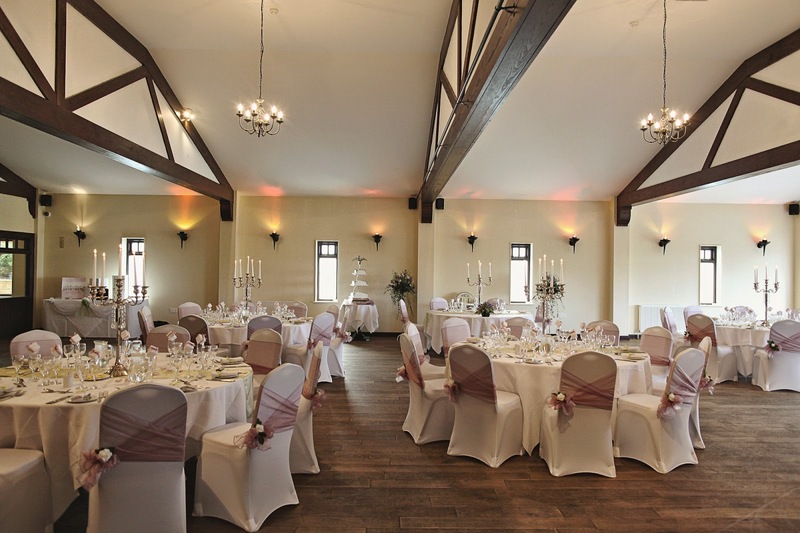 The hotel is licensed for civil wedding and partnerships, and with their Dovecote Suite - a converted barn which can house up to 150 guests for your ceremony and wedding breakfast, as well as many different options for an outdoor wedding in their stunning grounds - it really would be the most idyllic location for your nuptials. 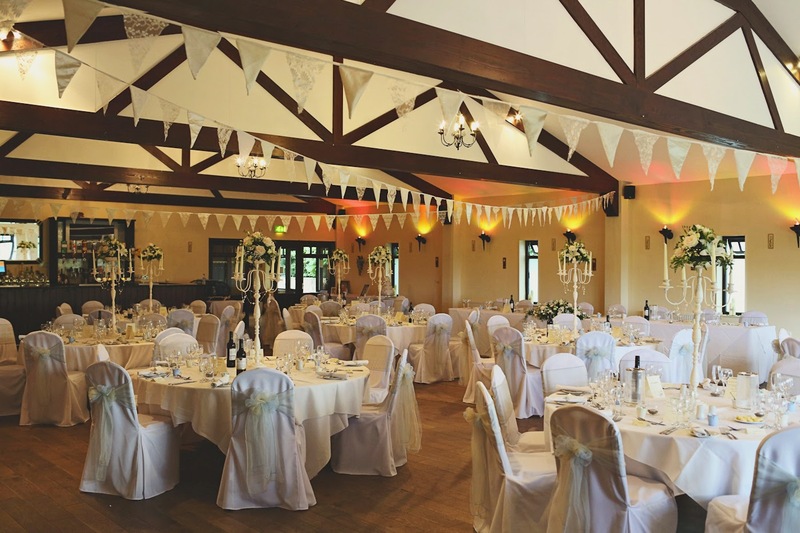 Check out Ox Pasture Hall's wedding section on their website for more information. Or even on Pinterest here. Disclaimer: We were kindly gifted a night for two in a suite at Ox Pasture Hall Country House Hotel, including dinner for two with drinks at The Courtyard Restaurant, breakfast and afternoon tea the following day, in exchange for this review. All opinions are truly my own, and all photographs are mine excluding the hotel logo, and wedding photographs, which were supplied to me by the hotel.